For driving directions using Google Maps, click here. Visitor parking is at the entrance and along the circle of campus. Additional parking is available in the back parking lot. Visitors must register with the front office located to the left of the main lobby. In the mornings and afternoons, Archbishop Carroll operates shuttle buses from/to four locations in Prince George’s County — Bowie, Largo, Clinton, and Forestville. For costs and registration information, contact Tim Fudd. 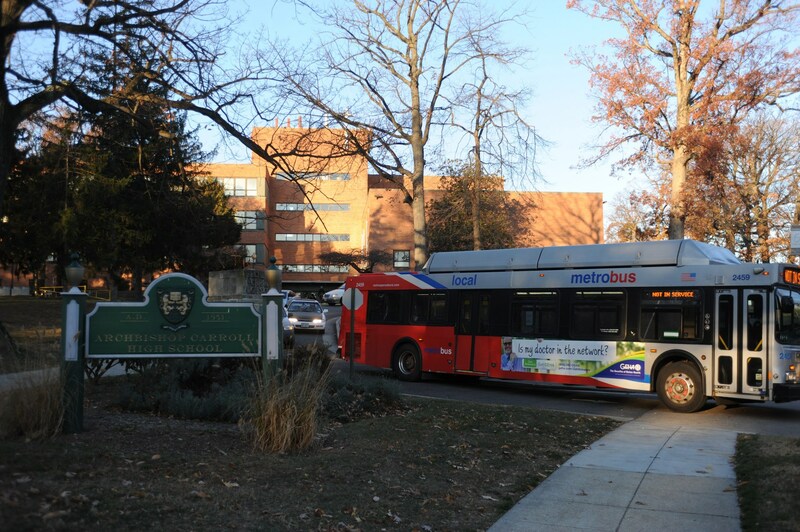 In the afternoons, the school offers a free shuttle from the campus to the Brookland-Catholic University Metro stop. The shuttle leaves from the drive outside the student lobby every half hour from dismissal to 7 p.m. Students are encouraged to take the shuttle to the Metro after school. Click here to use WMATA’s Trip Planner tool to plan your trip to Archbishop Carroll. The nearest metrorail/subway station to the Archbishop Carroll High School campus is the Brookland-Catholic University station. From there, exit the Brookland-Catholic University metro station, turning right/west (away from Catholic University) and proceed to the bus stop for the H8 bus route. By Red Line, follow to Brookland-Catholic University Station. By Blue Line, transfer to Red Line (toward Glenmont) at Metro Center station. Follow Red Line five stops to Brookland-Catholic University station. By Yellow Line transfer to the Red Line (toward Glenmont) at Gallery Place-Chinatown and follow Red Line four stops to Brookland-Catholic University station. By Green Line (from Greenbelt, Md), transfer to Red Line (toward Shady Grove) at Fort Totten station. Follow Red Line one stop to Brookland-Catholic University station. By Green Line (from Anacostia area), transfer to the Red Line (toward Glenmont) at Gallery Place-Chinatown. Follow Red Line four stops to Brookland-Catholic University station. Click here for H8/H9 schedule.